Some recent images of Iceland by Elizabeth Adams. Book designer, artist, writer, publisher, editor and more... If you haven't taken a peek at the recent work of Elizabeth Adams, I recommend that you do. She is a wonderful example of spirit in action, moving toward the beautiful. 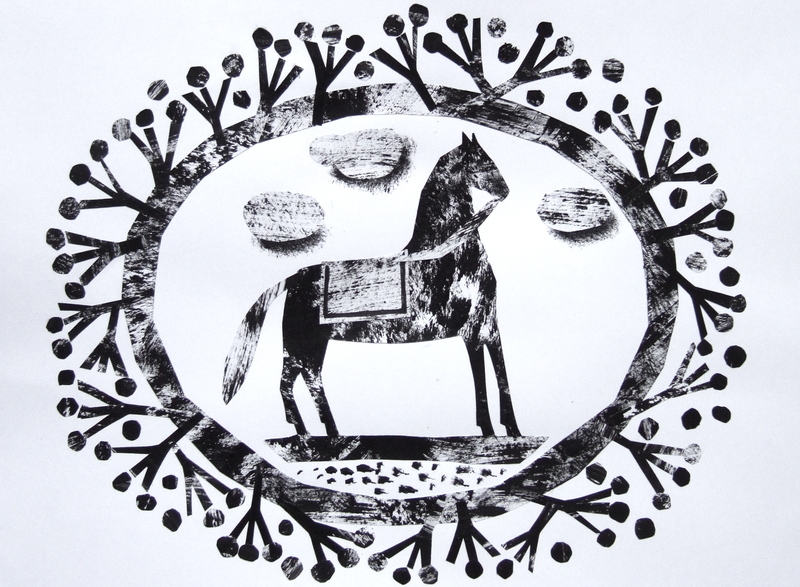 Beth has a lot of muscular new pieces inspired by her trip to Iceland, all discussed on her blog, The Cassandra Pages. Want a print or painting of your own? Try Studio Cassandra, where Beth has a brand new Etsy shop with work that is affordable and beautiful. I was glad to see this picture of my father and the rest of the crew of the Incendiary Blonde. (My father is standing, all the way to the right.) At seventeen, my father left his life as a sharecropper's son near Lexsy, Georgia, joined the Army Air Corps, and began to see the world as he trained in the West and North. I remember him telling me that people elsewhere were ignorant about the South, and how a woman in Kutztown, PA asked him about the family slaves. Before long, he was serving as a tail gunner with on the Incendiary Blonde (91st Bomb Group), based in England and flying on runs over Germany and France. He was tall and slender, and would do a backward roll when leaving his perch in the tail of the plane. The linked picture was taken shortly after shrapnel struck and killed the mid-waist gunner, Blaine Corbin (the name is spelled incorrectly in the note.) My father told me that the day Corbin died was the very last day that waist gunners were utilized in World War II. Ill luck married irony in that loss. Thanks to the wonders of the internet, I see that his widow, Ruth, died just last year... She married again, graduated from college, saw life bring her children and grandchildren and great-grandchildren, and appears to have been the sort of volunteer who blesses the world with work. She lived a different life from the one she began with Blaine, but it seems as though it was a good one. They are almost all gone now, the men in that picture, though they were beautiful with youth not so long ago. Some of the vivid traits in the character of Pip in A Death at the White Camellia Orphanage come from my father. I must finish reading some books for a phone conference in the morning, plus I have a ferrying job today, so . . . frolic as you like, here or elsewhere! Soon I will do a post on the recommended new(ish) poetry books, so if you have something to add, please add a book. I am surprised by how many people have popped by to read this piece, and am wondering if that is simply because I mentioned a controversy (Giraldi-Ohlin), or whether people relish the idea of turning their backs on things they are "supposed" to do and following the muse through "hollow lands and hilly lands." Perhaps both. Post-postscript: You know that business about the roaming balrogs in the comments header? They're getting quite fat. I wake up, three hours after I fell asleep. Someone is snoring, and one of my children has gone to bed with all the lights left burning. It is the bottom of the night, the beginning of day, the place where unease is stored. Lying in bed, I worry about all sorts of things I cannot compass. I worry about whether my husband will be eaten this fall by something that sneaks around the tent platform at night, far off in Mozambique (even though he is still here) or by some trampling or lurching creature in the day. I worry about my several grown or nearly-grown children and my youngest, soon to start tenth grade. Then I worry about whether my latest novel will survive a launch without ARCs and about the familiar craziness of publishing's luck and error. (But I don't bother worrying about the new book of poetry because the book is so beautiful and because these days poetry is always doomed.) I worry about various invitations to speak far away and whether I can manage to take them. I worry about whether I will finish reading 316 novels for my judging stint by deadline, and whether I can juggle reading those books plus being mother and father to three at-home children when my husband goes wandering. I had forgotten how one feels unease at the bottom of the night, just before the birds wake and the sun hauls itself up over the horizon. Were it not for the details and the aches that tell me my age, I might be roaming the dark places of my 20's. All of this sweeps through me in moments. Then I give my worry away to the air that drifts through the window. The unease floats away, upward, seeking after heaven like strange incense. 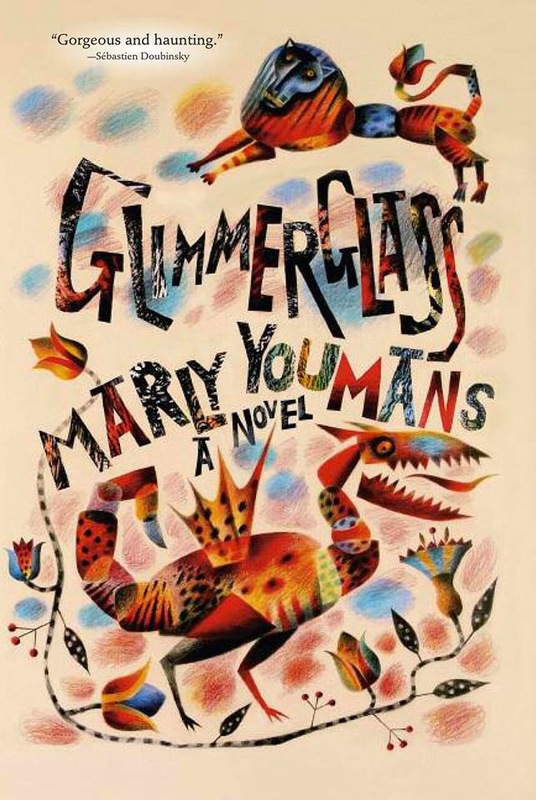 Though sailing through hundreds of assigned books this summer, I sometimes miss a more aimless kind of reading--a reading that has no mandated goal but to wander and occasionally be seized. Most of the books I'm reading now are novels, and I'm thinking about how I'd like to read more poetry. I came home from the West Chester Poetry Conference with a sack of books by my panelists and others. In the fall I will have more time for those. But if anybody has a new(ish) poetry collection or long poem they'd like to recommend, please note it in the comments, and leave a snip or a poem if you have the energy and can find the book--always my problem, books being so good at camouflage. If you are a poet, feel free to recommend your own book as well. (Please leave a sample!) And if you are an editor of a 'zine or journal, feel free to recommend as well. "Because a fire was in my head"
If one is to judge by the buzz of thanksgiving that burdens the acknowledgment pages of new books, a hive mind seems to have seized the little nation of writers. But the beautiful idea or image that burns in the head is not meant to lead toward committee work. Whether they are accurate or not, comments can point to where something is amiss. That's fine. Nevertheless, a writer needs to make free choices, unhindered. To do otherwise is to welcome the safety of a hobble. The words in a book need to be set in proper order by one sensibility, and the writer must possess a portion of self-reliance for that to happen. Sometimes a book is a steppingstone or a wrong direction rather than the perfection (the golden apples of the sun and silver apples of the moon) dreamed and glimpsed. Yet a steppingstone or wrong path may be precisely the thing that was needed, not by the canny peddler's need for "product" but by the uncanny demands of art. Spotted on Twitter: I was amused to see a mention of a post of mine about the wedding (long time ago--my mother turned out to be a belated ninth child) of my Morris grandparents in the 'zine, Wedding Flowers, just below a note on Natalie Portman's vegan-and-wildflower wedding. If you'd like a peek at the young milliner's headdress and magnolia bouquet, go here. Many of the posts and twitterings that met William Giraldi’s NYT review of books by Alix Ohlin, a professor at Lafayette College in Pennsylvania, sound a note of hysteria. Like all such kerfuffles, the responses have quickly moved from concrete talk about style and story to accusations of misogyny, jealousy, and viciousness. I am distant and obscure enough, here in the rural hills, to remain unruffled and at times amused. But it has made me think about my choices in life, and now to write with frankness about them for the first time. Long ago I quit academia after five years of teaching, gaining my tenure two years early and promptly saying good-by. I have never explained here or elsewhere why I left my secure perch because I have so many friends who teach and write. The foremost reason for me was that I found tenure and full-time teaching to be a bad idea for a writer. Ten books and three forthcoming books later—poetry, novels, and several fantasies for children--I can say that I do not regret my decision. I lost a good deal of security and salary, and I fell from the academic realm of writers, but I gained freedom to do exactly as I liked in words. No book I wrote would be needed for promotion or merit pay. I could strive as I liked, and could spend months in a way that might seem wasteful to others but was the path forward for me. I had no need to throw myself into print. As a young poet, and later as a poet and writer of stories and novels, I had no need to think better of my work than it deserved at the time. Sudden mad desires that might result in no publication at all could be fulfilled. I could write a book that started with a vivid dream (Catherwood, FSG, 1996.) I could write a post-apocalyptic epic in blank verse (Thaliad, CA: Phoenicia, 2012). I could write a novel set entirely in and on trees (Val/Orson, UK: PS, 2009). My daughter's request for fantasies could lead me to write two Southern fantasies combining Cherokee and Scots-Irish lore (The Curse of the Raven Mocker and Ingledove, FSG 2003 and FSG 2005.) Would A Death at the White Camellia Orphanage (Mercer, 2012) be what it is--perhaps my best novel--if hurry and an academic calendar had governed my decisions? Nor did I have to pour out my creativity (as I certainly once did) on planning classes in detail, rereading where duty led, or putting on a class performance that would draw in those who were not lured by the assigned reading. I saved all that hard work and verve for my writing and for my three children; both in turn nourished the desire to create and the joy of arranging words in fresh shapes. Like any life, mine is smeared and marked by what I unfashionably admit to be sin and error and wrong choices. But I have been true to words. Book after book, I have made new worlds as I wished and as my joy in words led. I have in great part ignored the world’s view and clung to my own, whether that was the “smart” thing to do or not. In these matters, to paraphrase Anne Bradstreet, Vie with me if you can. Lots more pictures, inside and out, at the Artlog. In this installment of Tinies, Old Martin appears as a young man. New to Tinies? These are pieces I've written while spending so much time on a major reading project that I've had little time to write. They are wandering word-doodles, leading where they will. To read from the start, click on the little Tinies label below or scroll down. New to my work? 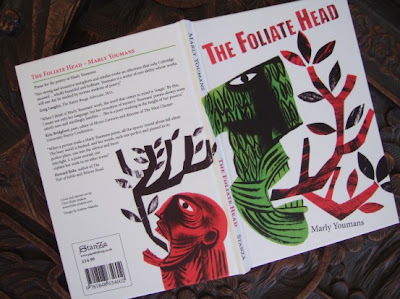 My 2012 books are a novel, A Death at the White Camellia Orphanage, and a collection of poems, The Foliate Head. 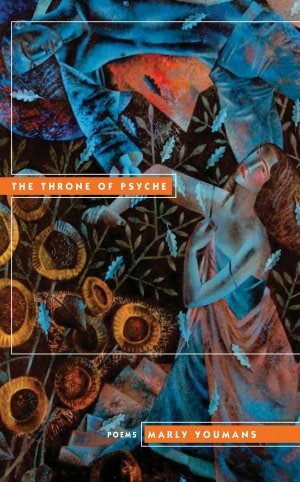 Last year saw another collection, The Throne of Psyche. You can click on the tabs above for more information. Also forthcoming this year is a long poem, Thaliad. One day I asked Old Martin how he came to be here. My picture of what happened to him is obscure. Certain words keep their strangeness: causeway, car, suburbs. We have none of those things. Old Martin (he was Young Martin then) drove along a causeway with a steep drop on either side. Suddenly the world darkened, as if the car’s windows had turned to smoked glass. The air grew steadily darker, and he grew more and more uneasy. He opened the door to look for a yellow dividing line on the road. A small popping noise inside his head made Young Martin suspect that he was having an ocular migraine. He frequently saw rain in the middle distance, he told me, when it was not raining at all. When he reached the end of the causeway, he pulled onto the edge of the road. Slowly the darkness ebbed, but the world looked unfamiliar. He thought it must be the afterglow of his aura, but the sensation did not wear off when he drove on. The road did not take him through the suburbs he expected but dwindled into a rutted track between flowering trees. Eventually all his fuel burned away, and he was forced to get out and walk. Young Martin’s head ached. It was raining in the middle distance, and as he walked, the rain moved ahead of him like an enormous but fragile pillar. I spent a good bit of yesterday evening overhauling the blog and side bars and making (and unmaking and making again) changes visible and invisible. In response to comments here and elsewhere, word verification is gone; I'll try to keep it off and use spam controls instead. I've gotten some positive comments about the changes on twitter and some pleasant e-notes from friends (thank you, you supportive people.) If you have any comments, criticisms, or suggestions, now is the time to shout, whine, and complain! More Tinies to come, but right now I must continue with The Enormous Read. After a day off, I'm ready for more words; I am at 230 books or thereabouts. It's easy to lose count. In the last months I have learned a great many things about writing and judging, and no doubt many posts to come will have something to do with the months of reading. Tinies no. 6 lands on a Sunday, and that seems right because it's called "Words," and my favorite verse in the Bible invokes the rich, multi-stranded idea of λόγος (Logos): In the beginning was the Word, and the Word was with God, and the Word was God. Tinies no. 6 is a smaller view of "word," although it too involves (as in Genesis 1) the making of a world (here in imagination) by through words. If you want to read all the tinies, either scroll down or else click on the Tinies label below. They will make more sense that way! Old Martin taught us the words. He made us a dictionary and wrote down what he remembered. It is a lot and a little all at once. I have pored over his pages, learning to read and then wanting to know everything about the place where I was born and where I belong. And I do know a great deal now, and how that world is faulty and fair at once and infinitely complex. Yet what I hold is only a fragment, and so much more might be known. When I lie on my mat, dreaming of the other world where are people who know my name, I feel a great longing but also a kind of shame. I wonder if I am worthy of the dream, and whether my smattering of learning can ever compass the blue and green sphere of that world, flying, hooping the sun. But that world must stay as is in my dreams: I shall never know more unless I find a way and pass through. So the old world pieced from Old Martin’s words must be partial and lame and tilted on an axis between knowing and unknowing. This was a busy morning with ferrying the eldest to an interview and having a friend who is going to Mozambique with my husband for a farmer's market brunch (hurrah for Mr. Perry, "The Welsh Baker!") and then a suitcase-contents inspection. Now I must get back to the big reading project, but first I'll post the fifth of the Tinies. A memory of two sorts of flowers in a meadow and a hand are hardly enough for home. And yet that memory tethers me to something that is solid and real, a whole world of icebergs and mountains and seas that lie in the great troughs between the mountains. And yet it is only a wisp. Perhaps when I have been here as long as Old Martin, I will forget the two sorts of flowers and the grassy meadow and the hand curled around mine and think that there is nothing but this world. Or perhaps I will find a door and fall headlong into my world. 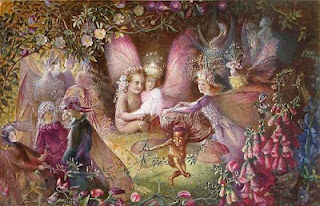 And perhaps it will be like the fairy stories Old Martin told when I was small, and only a week will have passed, and the one who held my hand will know my face and name, and I will become a little child again. But perhaps all will change in an instant, and I will be bent and old, my hair a great cloud of staticky white, and no one will know me in that place. Then I will have nothing but grief to hold my hand. Perhaps I will find a door and turn the knob, yet only lie beside the opening, looking through at a brighter world that I dare not enter. It's time for another of the Tinies, those mysterious word-doodles that I have committed while being too busy with a major reading deadline to write (but one can't not write entirely, of course.) Scroll down to see earlier Tinies or else click on the Tinies label below. Omin says that everything is a prayer. When he lets his glistening line into the deep, past the push of mid-sea waves and into the heavy stillness, right down until the world turns black: that’s prayer. When he brings up the pick-up sticks of the drowned, it’s prayer. When he cauls them in cloth made from the silk of spiders, that too is prayer. When he holds the pearls of eyes in his hands, prayer. The passage of blood through his veins is prayer. The drift of the soul from the body, prayer. The scales of the fish, catching the light in rainbows and adhering to a salty, weathered bench, prayer. The sniff, sniff, sniff of the broom along the floor is prayer. The first time I glimpsed what he meant, I felt the orb of sun rolling in my veins, shooting through me as if my body were a great pinball machine—though I have never seen such a thing, and my imaginings of objects from the other world are all filtered through Old Martin. What I felt was more life, an excess hardly bearable. It took me, and I cried out because always I fear being taken. Here's another in a series of word doodles made during the months devoted to award reading (June-Sept 15), when I had (and have) little time for myself... Click on the "Tinies" label below if you would like to read from the beginning, or else scroll down. 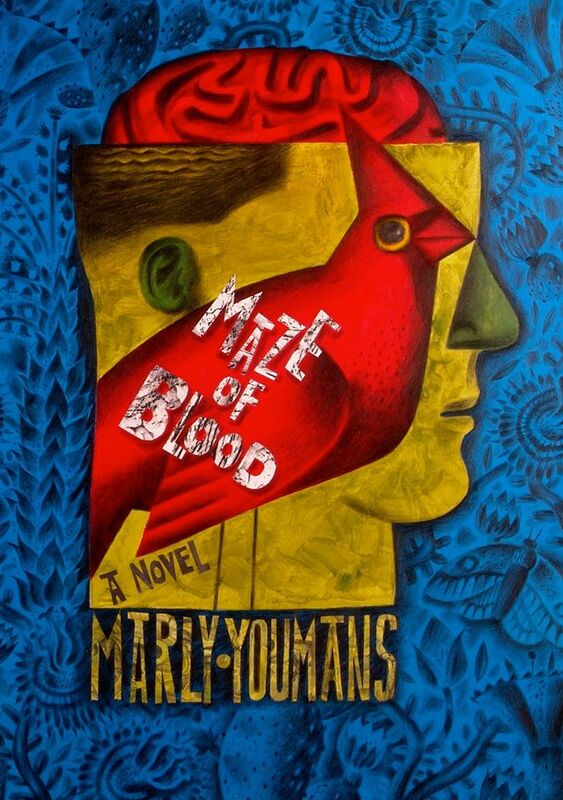 If you want to see my 2012 publications, please check out the tabs above for the novel, A Death at the White Camellia Orphanage (Mercer), winner of The Ferrol Sams Award, and the just-out collection of poetry, The Foliate Head (UK: Stanza Press), with art by Clive Hicks-Jenkins and design by Andrew Wakelin, both of Wales. Limited edition. Forthcoming from Phoenicia Publishing in Montreal is a long poem, Thaliad, also with artwork by Clive. Reknel is Omin’s other self: that is how they say wife or husband in this country. Where Omin is thin and big-headed like the stripped bones of a fish, Reknel is plump as a pastry wrapped around cream. Where Omin travels endlessly, letting down his lines into the ocean, Reknel stays moored at home. She goes nowhere, sees nothing. She drifts from the cleaning board outside where she scrapes and guts the fish that Omin brings home to the outdoor pit where she roasts the flesh. And yet Reknel knows—she lets down her line and catches the shadow of thoughts, lets them harden into silhouettes that she holds to the light. Her thoughts swim around her like black fish. She sits in the midst of a great and complex mobile of visible thought. I see the thinking run across her face like light. She says that this world is just my world, folded an extra time. I’m still pondering what that might mean. The news has gone out on facebook and Twitter and elsewhere, so perhaps not many will be surprised: rumor had it this morning that The Foliate Head had been returned (again) from the printers--this time we hope it is perfect. And then Clive wrote me that at least one pre-order in the UK had been received. So we are hoping to receive our copies soon. Art by Clive Hicks-Jenkins. Book design by Andrew Wakelin. Some suggestions from Peter Wakelin as well! And poems by me. Feels so strange to have a tenth book. And Thaliad next. Had a jolly dinner in Medusa, New York with five writers from L. A., New York City, and the Catskills. Not a one showed snaky locks or turned me to stone. One of the grand things about the internet is connecting with new people and then meeting them. Zipped back in the wee hours and pouring rain. Omin spends all his days fishing at sea. His spindly, absurd machines sparkle with salt and sun. He cranks the handles, lowering his intricate wheel upon wheel of line (silvery, glistening with scales) into the deep. 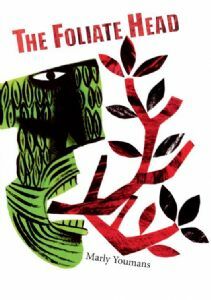 It is his calling to collect the pearls that were eyes from the sea, to find every bone that sank, marionette-strung and jointed, into the green wave and down, down, down to where the fish begin to flicker in the long dark. Omin is as rickety as his harrowing machine, with his long, thin arm and leg bones and the knobbles of his vertebrae that show when he bends to his work. I like to go with him on the boat, to hold his findings in my hands that are still young and not worn by the salt and waves of life. I like to think that some day I will be harrowed and fished from this world, flung into the meadow of light where I walked, hand in hand, before I found the tree with its little door. For weeks at a time Omin wanders the ocean till his ears ring like church bells, and the waves tip back and forth like great cast bells, and his small white boxes are overflowing with pearls the size of jingle bells, and the bones are infinitely worn clappers wrapped in cloth to still them, keep them from vibrating—to bring rest to the drowned and lost so that the whole wobbling planet can be steadied and not call out to the stars and moons of space like a sounding bell. If you're interested in seeing what's new with me, please check out the A Death at the White Camellia Orphanage (new novel - The Ferrol Sams Award) and The Foliate Head (new collection of formal poetry) links above. I have discovered that having to read 316 books (I am on 190 right now, this very minute--just glanced away) in a short period of time is a good way to put a stop to my own writing. So I'm noodling about a bit, writing some Tinies that are related but maybe not going anywhere, maybe not prose poems, maybe not stories, maybe just seedlets blown like parachutes by the wind. Here's the first one. They took me. I was small and hardly remember, but there are seven of us who speak the old language in this place, and one who remembers--Old Martin, who was taken another way (by a greenish, glowing jellyfish that hovered in the sky, catching him in its tentacles and drawing him upward, or so he says when he doesn’t say “a machine of lights.” Or when he doesn't tell some other story entirely.) I love Old Martin because he taught me in secret the letters to write down what comes into my mind, what I see, what little I remember. Evidently when you have three and a half months to read 300+ books, you need to take very good care of your neck and back. I am longing for poet Dale Favier, Monsieur le Masseur, to drop by from the other side of the continent. Today all I can think about is pains in the neck. ...complaint is the first symptom of criticism. If the avant-garde wants to make it new, in Pound’s dictum, what can be left to accomplish when the etiquette has been as codified as the place setting for a twelve-course banquet? Free verse looks easy to the outsider, as if it just fell off the lap of prose—if you’re going to write a long poem, however, perhaps you ought to possess some ear for the poetic line. Few poets have examined their bodies more minutely (you feel she hides a speculum in her purse) or taken more childish satisfaction in announcing everything they find. If a poet has no particular verbal gifts, he’s dependent on an odd point of view, or a warming tone, or—always the refuge of a scoundrel—something to say. 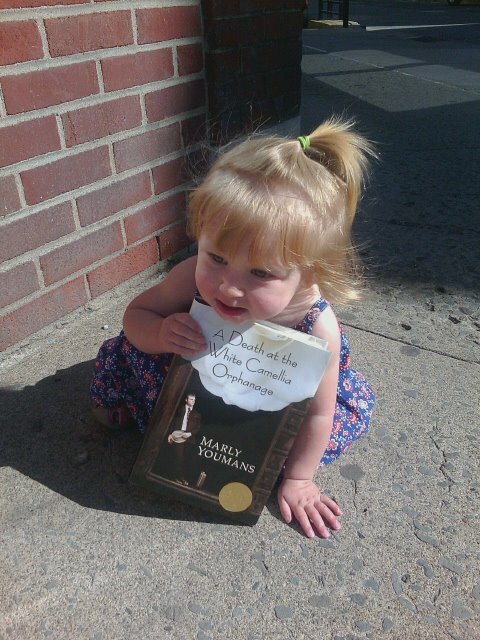 It’s hard to write from a child’s point of view without fatally compromising the illusion or seeming cheerfully stupid. Even if you paid through the nose to get a vanity press to publish this, you’d have to bribe the typesetter not to cut his own throat. How can the prescient dog not howl? Only Shrödinger’s cat knows for sure, and I confess I was laughing too hard to ask it. He’s as protean as many British poets—they write plays, libretti, novels, translations, songs (you’re surprised they haven’t been asked to rewrite traffic laws or contribute the occasional slogan to a Marmite campaign). Were he unfortunate enough to develop Alzheimer’s, the poems wouldn’t change a bit. The ghost of William McGonagall must be jealous. There’s no poet quite so in love with her own pain, no contemporary purer in her extremity— she has the gorgeous gloominess of Sylvia Plath, her angers scrunched up like damp handkerchiefs. A poet’s talents exist in productive tension for only a decade or so. Before, the language is all main force, the subjects mistaken, the voice immature; after, the poet often hardens into manner, his subjects written to extinction. As he ages, a poet’s main competitor is himself —his younger, ravenous, unforgiving self. Want to guess? The answer is in comments. There is virtue in virtuosity, especially today, when it protects us from the tedious spectacle of ineptitude. When an audience that has lost all touch with the classical background once considered indispensable in education sees Virgil written in a picture, it accepts it as a logo, like the alligator on a Lacoste shirt. The mere dropping of the name, or the citation of a tag, suggests that a classical past still lives, solid and whole, below the surface. But a toenail paring isn’t a body. In addition to what one can find in his books, his essays on late Goya, on artists he saw as hollow men, and much more sprinkle the internet. They shed a sometimes fierce light. As many people who don't know him as art critic know him as the author of The Fatal Shore, I should mention this tribute by writer Peter Carey, saying what Hughes meant (or should have meant) to Australia. The voices around the fire slid away. All Pip’s thoughts were gathered and reaped: there was nothing in his mind but Opal and the pallor of her wrist with the little blue vein flicking across—he tightened his grip and claimed her for his own. A surprising power burns in the demands of a boy who has seen and known too much. Her dead husband under the apple tree made no protest. Already he was nothing but bones, shreds of cloth, hair glued to a skull. The blackness of the universe, with which Pip was already acquainted, made no comment. The earth trembled slightly under his feet as a train swooped forward, ten miles off. For days he had been sleepwalking along the wooden ties, feeling detached and ghostly. Suddenly the world slipped into place and was again genuine, and the connection between him and Opal glittered in the air like the lace of a quarter-million miles of steel track, the paired rails racing side-by-side over into valleys once jammed with men dreaming gold as they gouged a pickaxe into the hip of earth. Lines shot across the continent, gripping down and holding North America in her place on the shifting seas. 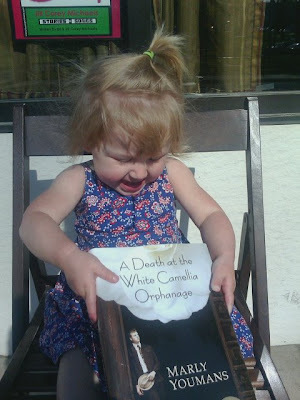 Publishing's famous three-month window for a novel to show what it is going to do is now in the past for A Death at the White Camellia Orphanage (Mercer, 2012.) A prize winner from a university press, the book was never going to burst into the world like a pent-up waterfall. I hope instead that it will continue to sell and be read, trickling and streaming here and there. Something about reading hundreds of new books for a deadline is making me feel wistful--in part because not writing much makes me feel askew. But thoughts about how the world has changed in the past fifty years keep drifting by, and though many things have changed for the better, I am having a positively Yeatsian regret for lovely old courtesies that have been lost... A good deal of lovelessness is abroad in the world and shows up between the sexes, between political parties, between young and old, between all sorts of groups. As I grow older, it seems to me that though my days are often complicated and overly busy, the goals in regard to others are terribly simple: to strive harder to treat people with care and love, remembering that we all come from the same source, and to hold fast and be true to the gift of words so that I can, in my turn, give gifts worth the giving. 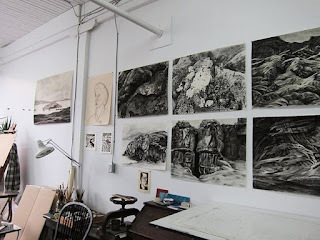 Clive Hicks-Jenkins has posted about the process of making collage vignettes for Thaliad (Montreal: Phoenicia Publishing, November 2012) here. 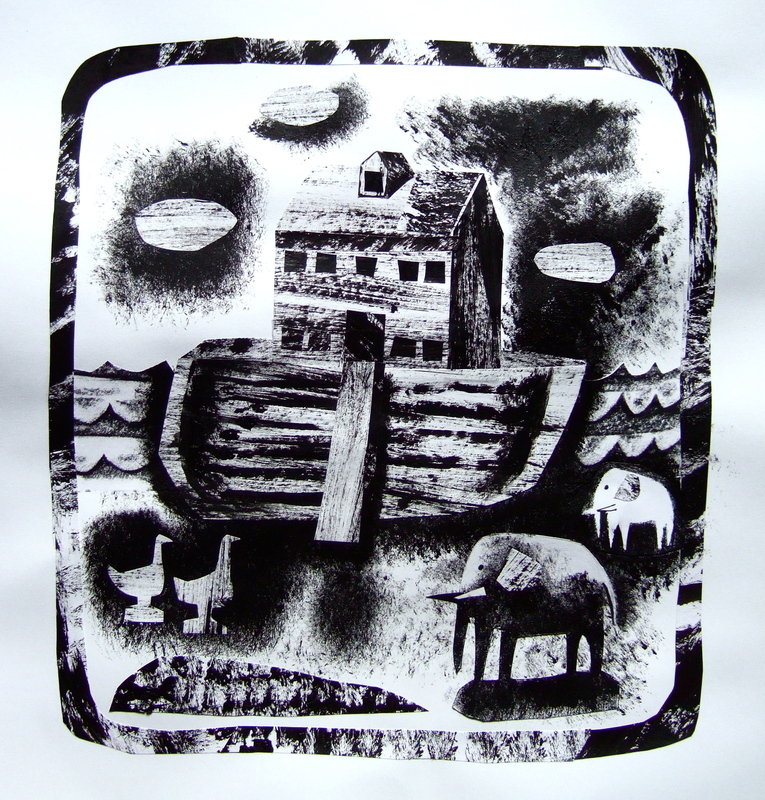 See his preparatory sketches and mark-making sheets and more. This definition is rather different from the ones I usually detect or see defined, and I like it--the author is more like an oyster pricked by grit and building a pearl from nacre, layer by layer. 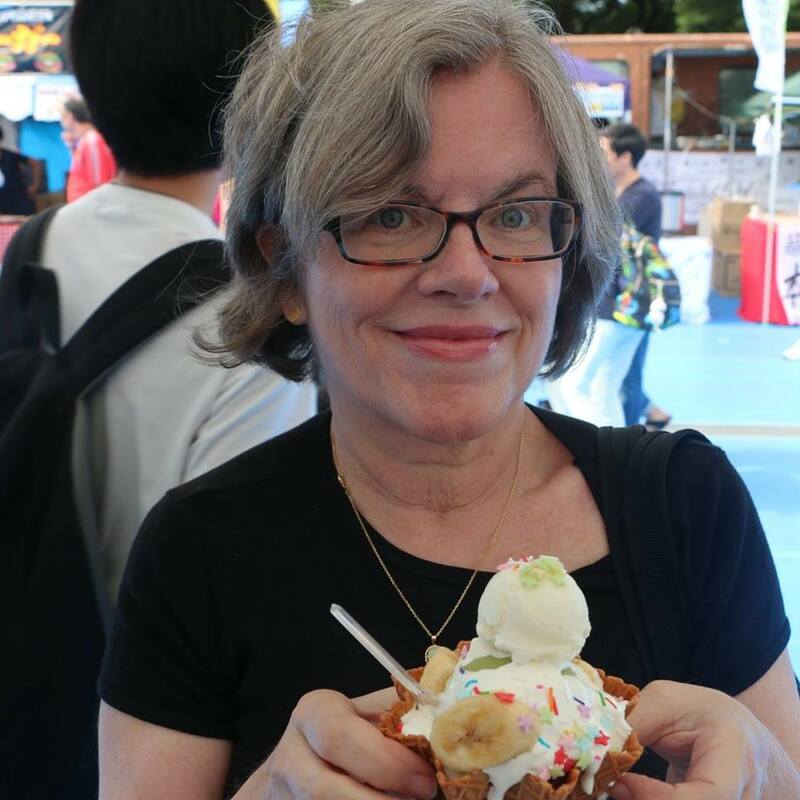 This morning I received a lovely letter about A Death at the White Camellia Orphanage and many other things from Deborah Bohlmann, who I met through my now-receding-into-the-past national working group at Yale Divinity School. (I still hear from people in the Faith as a Way of Life group from time to time, especially Makoto Fujimura--he and I were the official artists in the group, though a great many of the members were writers of one sort or another, and several of them shared poetry with me.) While it's pleasant to read about the ways in which someone you like admires a book, it's also interesting when an intelligent person sees a story clearly. I was taken with the clarity of her reading when she says, "I had not realized which death the book was most truly about, that it was about the emotional death Pip was struggling with, and the answer was love." The world knows her best through her public roles--she's a wife and a mother of two sons and a daughter (just like me--and I can say that mother of three is a fairly consuming ), and she is a first-rate English teacher in the St. Louis public schools. But she also writes poetry and is working on a memoir. She has had an active St. Louis writing group in the past, but at the moment her only "group" is an uncle, Walt--Walter Wangerin, Jr., who has written oodles of books and is best known for The Book of the Dun Cow, which won a National Book Award in the one year that an award was given for science fiction. I look forward to holding Deb's first book in my hands. Labels: Deborah Bohlmann, Walter Wangerin Jr. So here's a poem not mine, as my "free" time has been devoted to award reading and housecleaning this weekend. It's by Maryann Corbett, from Breath Control (David Robert Books, 2012), which I plucked up while at West Chester Poetry Conference for a couple of days. nothing is tame here, nothing without its dangers. dynamic range from freight train to tsunami. You don't hear this: you quail before its power. The fourths and fifths of its harmonies opening like jaws. goes quiet and settles an arm around your shoulder. If you don't know what sacred harp is, fly here. As the day is yet another of reading many books for an award, plus cleaning up for the arrival of child no. 1 from North Carolina, I leave you with an introduction and poem borrowed from Phoenicia Publishing and Ancient Lights. The book is available in paper or hardcover direct from the publisher (ordering direct is, of course, beneficial to a small press) or by order through your favorite indie or online site. Or is the key a bestseller status--one is BIG? I looked up J. K. Rowling's first book for an adult audience; her jacket is like that, if they stick to the current jacket proposal. So, as John says at one point, it may be primarily a nod to the fame and bestsellerdom of the writer. It is a kind of minimalism that relies on color and typeface only (rather than what is called "emotional engagement" in the book-design biz), and yet it hits the maximum in being hyper-bold. That giant type size always has clarity of a kind--and perhaps ignores that jacket/cover goal of being connected because it assumes you are already linked through at least general knowledge to the writer. Buy me, I'm by an important writer! No doubt all this has something to do with what we find in results like the annual VIDA count. Because if women are reviewed less often and appear as reviewers less often, well, that is going to have an impact on how "big" they are seen to be. (Confession: I rarely review--only when bothered into it.) And then I start to wonder if "literary" women are more prone to such lesserdom than "genre" women. That would be interesting to know; has somebody studied it? And I think about how these questions impact jackets like The Marriage Plot: literary book, domestic subject matter, and yet very restrained jacket. (Didn't Meg Wolitzer get into that issue during a certain recent fracas?) But I can't think about all that right now. Right now, dear people, I must go clean my house! Husband home from Mt. Katahdin is off to North Carolina mountains. Mozambique next. Exhausting, all this waving. Many of the images for Thaliad (Phoenicia Publishing of Montreal) are to be kept under wraps until November 1, but the ones I have seen are wondrous and fit together with the text in a way I like--not straightforward illustrations but a running accompaniment of vignettes suggestive of handwork and needlework and tradition, as if the events of the poem have been memorialized in cottage handicraft work. They are both of our time and another, and that is entirely fitting for the poem. Beth Adams will have many decisions to make, fitting all these lovely images into the formatted text. Elsewhere: Evidently The Foliate Head came back from the printers and was found to be defective (some loose pages) and the whole batch sent back for redo. So still in pre-order. Unless, of course, it's back! 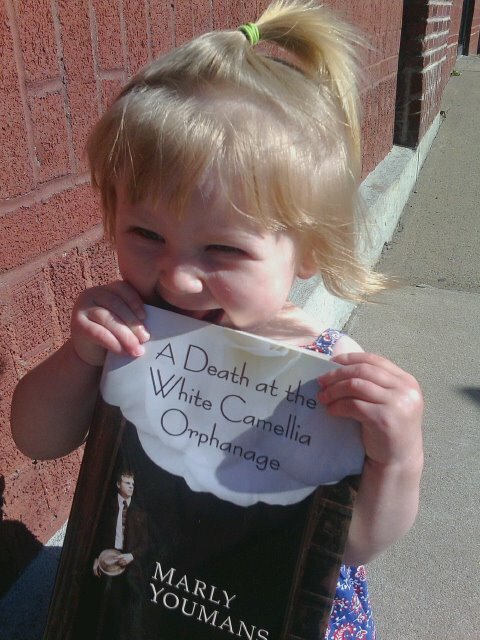 Most recent review of A Death at the White Camellia Orphanage is here. Updates: A Death at the White Camellia Orphanage page, new The Foliate Head page. 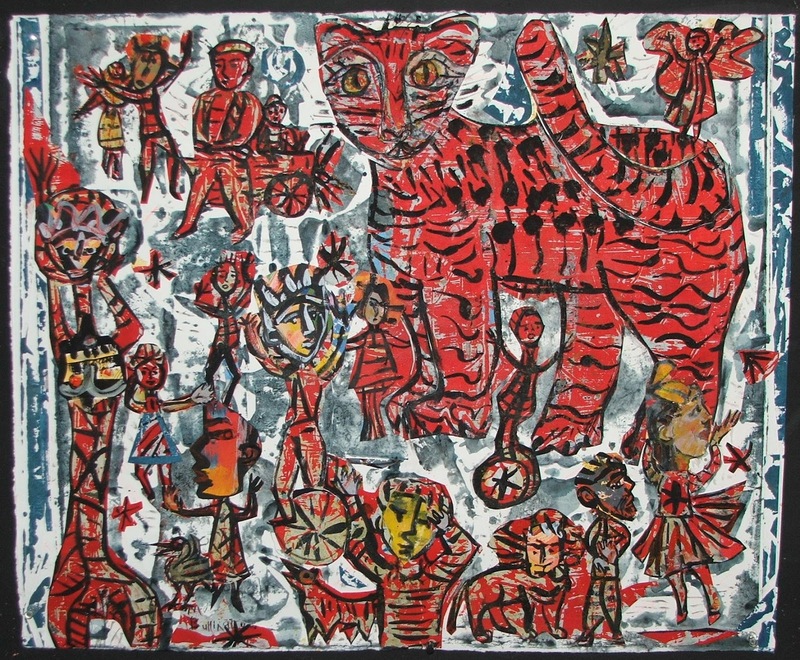 College friend Mary Bullington won 1st place in the Bath County art show "mixed media" category for "Dancing around the Big Red Tyger." 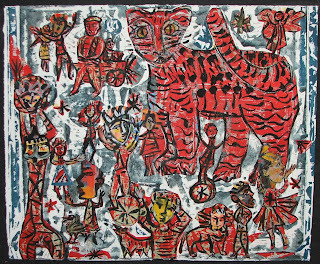 ("Tyger, Tyger," frolicking in the forests of Mary's quick and colorful mind.) The award was judged by Steve Cushner of The Corcoran Gallery's art school. Mary is a marvelous collagist and painter, and I have a silly little hope that somebody who is wonderfully rich and dripping with jewels will read this post and give her a car big enough to transport paintings--selfishly, so that I don't have to ride in the Bumbling Deathtrap the next time I go to Roanoke, and generously, so that she doesn't have to ride in the Deathtrap the next time she needs paints or groceries. She lives in a wonderful bungalow with cats (but not so many as to make her a Cat Lady) and paints like a wondrous madwoman.